Tasyrif Tajudin - Do You Want To Get Famous? This guy really had a very "big" mouth. He seems make facebook as a place for confessions or "amusement centre" to him. Luckily, a friend of ours traced his "big" mouth on facebook. Maybe he's the real culprit or he stupid young mind think that the incident happened only a jokes. You can check the link above here. 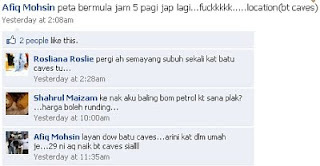 And also he put another comment by negotiating payment to "bomb" Batu Caves Hindu Temple. He changed his name from Tasyrif Tajudin to Shahrul Maizam. He found the incident happened as entertaining. And he don't even feel worried about it. His Facebook profiles suppose to be here http://www.facebook.com/profile.php?id=1071210468 but sadly maybe unbear the pressure, he already deleted his account. As you can see, if you type Tasyrif Tajudin on google, the result still pointing on his facebook account. He can run and hide but the trace still there. He don't know that the police can ask for his profile from Facebook database. Now he became really famous. I got this information about him (but not confirm yet) he is enrolled as a ASWARA College near Bank Negara, Kuala Lumpur and taking Theatre courses (2009/2010) and also got a scholarships. Hopefully the authority can do something about it.